Oak Hill School is a private state approved special education school creatively meeting the needs of each individual student. community-based education program for day and residential students. 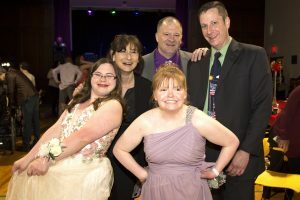 The school program serves students with moderate to severe disabilities from ages 3 to 21 including autism, emotional disabilities, behavioral challenges, and students with multiple disabilities. Our classrooms are located in the community. Many are located within the public schools. This offers a significant time with peers and integration into the community as appropriate. We are able to teach meaningful skills in real situations. Oak Hill School sets the standard in empowering students to learn through meaningful, functional, and innovative educational experiences which build self-advocacy, independence, and reinforce the dignity of students using comprehensive trans-disciplinary supports. To teach every student through creative, innovative, functional instruction and meaningful activities, so that each student will become more independent in his or her life.